The New York State Military Museum is pleased to announce the recent acquisition of a star from the historic flag Colonel Elmer E. Ellsworth took down from the Marshall House hotel in Alexandria, VA on May 24, 1861. The star was generously donated to the museum by the Town of Saratoga in New York State, where Colonel Ellsworth was born and raised. The dashing, young Colonel Ellsworth of the 11th New York Infantry Regiment (Fire Zouaves) was shot and killed by the hotel owner, James Jackson, as the colonel, carrying the flag, descended a stairway inside the hotel. Jackson was immediately shot and killed by Corporal Francis Brownell of Troy, NY. Ellsworth’s death was mourned by his friend President Lincoln and the nation. He was the first New Yorker killed and the first officer of note to die in the Civil War. Elmer Ellsworth was the first martyr to the Union cause and the flag he paid for with his life became a revered symbol of his heroism. James Jackson’s death elevated him to martyrdom in the Confederate states. 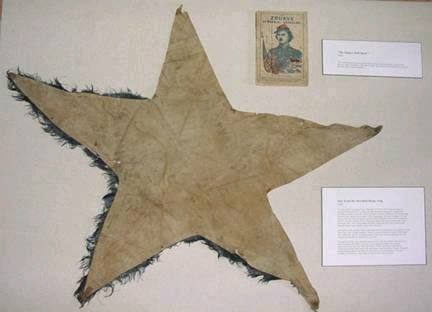 The star was reportedly removed from the flag and saved as a family keepsake by Richard Denton, Ellsworth’s uncle. Denton donated the star to a Saratoga County Grand Army of the Republic post and eventually the Town of Saratoga came into its possession. The star, after over 140 years, has finally been reunited with the original Marshall House flag which has been part of the Military Museum’s collection since the 1860’s. The New York State Military Museum’s battle flag collection, the largest state flag collection in the country, houses over 600 original Civil War flags. The New York State Military Museum’s normal hours are: Tuesday thru Saturday, 10:00 a.m. to 4:00 p.m. We are closed Sunday and Monday. Admission is free.